This is a spin-off prequel series which shows Paul Crocker, Tara Chase's current boss, in the days he was still a minder like her.The series is set in 1986 during the Cold War and features Paul Crocker trying to smuggle a Soviet Defector out of communist Prague. Very gripping old school spy story. The art is very similar to the other volumes, and fits the story as usual.This was a little more traditional than most Queen and Country volumes, but I enjoyed it as much as I did the others. 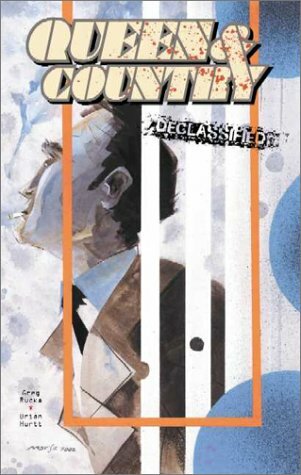 i'd never read any of these books before, but apparently there is a series of them and this is a flashback to the start of the career of one of the main characters.a spy thriller graphic novel set in communist europe towards the end of the cold war. i thought it was brilliantly done and will be looking for other books in the series. Alright, a book showing the storyline that is brought up often in the mainline series. Very cool to read, though probably an odd read for anyone who hasn't read the books since it's a little more 'fill in the blank yourself' than usual. I really don't have too much to say about this. The artwork is nice. While it's black and white, it's the kind of black and white artwork that's clear and easy to understand. Unlike some other things I've read, it's not dominated by black and thus murky and indistinct. The story is relatively simple and honestly not all that interesting. I think that may well be because it's realistic and also doesn't end well. I feel like as a comic book this should maybe have some element of fantasy to the story, although that's probably because I feel that I'd read a nonfiction work if I wanted to learn what real Cold War espionage was like. I think the other problem is that the characters feel bland and uninteresting. While I'm sure the main character is significant and well developed in the main Queen & Country series, here he is not particularly interesting. He's basically just the guy who sometimes screws up and has a new wife who doesn't totally understand his work. All in all, I feel like I'd enjoy this more if I was more familiar with the main series, which I would be willing to try despite the rather bland experience of reading this. Crocker as a minder is badass and fucked up, not a surprise. Great spin off. A tale from Paul Crocker's past when he was a Minder in the heart of the Cold War. This is a pretty straight forward smuggle-the-defector-arcoss-the-boarder tale, but there are nice twists and turns. It is also intriguing to see some of the events that have shaped Crocker into the leader he currently is. Really nice art in this one too. Greg Rucka Brian Hurtt - Greg Rucka, is an American comic book writer and novelist, known for his work on such comics as Action Comics, Batwoman: Detective Comics, and the miniseries Superman: World of New Krypton for DC Comics, and for novels such as his Queen & Country series.